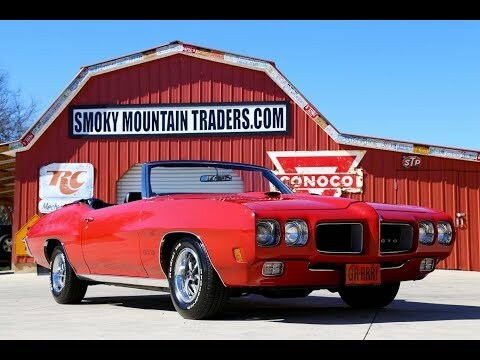 Imagine it's 1970 and you have finally purchased the car of your dreams, and it's 1 of only 3,615 Pontiac GTO Convertible's built. Along comes the 80's 90's and 00's, but there has only ever been that one dream car. You kept her stored away and took care of it just like the first day you brought her home. That's the opportunity you have here today. This car is a one family owned vehicle that has never been neglected. It comes with Warranty Card, Broadcast Sheet, PHS Docs, numerous receipts over the years documenting the mileage, and it has the Matching Numbers 400 Block. This is a rare opportunity to own a gorgeous Convertible that's showing just over 39K miles. As you can imagine the body on it is rock solid and has an excellent fit of all the panels! All the door gaps, hood gaps, and trunk gaps are equally impressive. The body is covered in Cardinal Red which is the factory color for this GTO. It has been kept in phenomenal condition over the years and shows a lot of factory paint!! This '70 has the Black Convertible top, that is Power and provides a perfect Complement to the Exterior/Interior Combo. All the chrome and stainless is also excellent considering the age and shows minimal aging. To finish off the look it's sitting on the Matching Set of Rally II JM Code 14X7 Wheels with BF Goodrich White Letter Tires. On the inside it's done in the Classic Black that provides a gorgeous complement to the exterior. When you look closely you'll be impressed with how amazing the condition of the interior is. We believe this to be the original interior in the car! It features bucket seats and console with the wood grain accent and automatic shifter. The seat covers, padding, and trim is all very nice. Looking at the dash you will see it has the wood grain accents as well and that the dash pad is just as impressive. This GTO does have the black boot for the when Power Top is down and it has as an awesome fit. In the trunk you'll see it has the mat, spare, and jack, and if you look closely you will notice that this trunk is just like it would have been from '70 with what appears to be the factory splatter paint! Under the hood it features the Matching Numbers 400 Block that's set up with the correct 9799068 Intake and correct 7040264 Quadrajet Carburetor that has the stock breather. The 400 is mated to the matching number Turbo 400 Trans and the Correct 10 Bolt Rear End with the WH 3.55 Gears. For exhaust you have the correct manifolds with new pipes and stock style mufflers with the factory Tips!! Now this GTO does come with Power Steering and Power Brakes with Disc on the front. When you look under this Goat the metal is all exceptional. All the pans appear to be original and solid as rock along with the Frame. It's always remarkable to see a car of this age look this amazing.